For almost 30 years now, and after over 63 arrests in three different countries for preaching the gospel of Jesus Christ in the open air, and constantly working with many street preachers facing constant arrests and imprisonments for “walking worthy of the vocation wherewith ye are called” (Ephesians 4:1), it has been our constant desire, and also the constant request of Federal Judges, Supreme Court Judges, lawyers and most street preachers, to organize a world wide fellowship, and standards institute for establishing both Biblical and Judicially recognized standards of ministerial conduct of the Open Air Evangelists. The open air street evangelist has from God, the calling (1 Corinthians 1:25-27/ 4:9, 10) in the ministry that is without exception, the most controversial aspect of the New Testament gospel ministration. Such a fellowship must needs be not just for establishing recognizable standards from both Biblical standing (Ephesians 6:10-14), but also for Judicially recognized standing in the Courts of Justice, which the Judges will be compelled to recognize, uphold and protect as a God called vocation of Biblical and Constitutional proportions. Such judicial standing demands not just the establishment of standards, but also the training and educating of members to follow such standards. 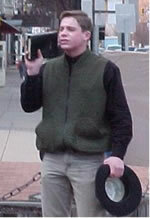 Hence, the Street Preachers’ Fellowship has been organized for the voluntary, and active fellowship, assistance and education of Street Preaching Ministers of God Almighty from all over the world, who are actively engaged in not just preaching the gospel of Jesus Christ, but who have the courage and character to warn a wicked world of the penalty and judgment of sin. Such men of God, possessing the character of “the express image” of God’s person (Hebrews 1:3) are constantly approving themselves the ministers of God “in prisons more frequent” (2 Corinthians 6:4,5/ 11:23) as this wicked nation and world demonstrate their hatred of God (Romans 1:30) in conflicts and confrontations with the street preaching lovers of God, who will not compromise or shut about Jesus Christ. For three decades, the street preaching minister of Christ often found himself all alone, fighting a losing battle against authorities bent on silencing his open witness and continual preaching. When we first began preaching in the streets of America some 28 years ago, there were not enough men of God actively doing so, to even attempt to organize. And though the judges of the higher courts constantly advised the few that did to join ranks, Why organize 7 men? But today, God has raised up a formidable army of street preaching fanatics, that are tired of the death tolling silence of 95% of Christian ministers who have confined the preaching of the gospel behind four walls while sin runs rampant in the streets of our communities. And hundreds of them are ready to help one another like nothing before, and with Bibles in hand, and signs following, they are joining ranks for the common cause of preaching the gospel of Jesus Christ to every creature, as mighty men of God, “and terrible as an army with banners” (Song of Solomon 6:10). The Fellowship’s goals are to structure and assist each member in the fulfillment of that purpose. Already, the battle is being drawn, and the fight is on in numerous places across America, as God fearing street preachers grow tired of the last ten years of pathetic excuses from the cowards for Christ, who have taught that the street preacher has to obey man rather than God to maintain some Laodecian ministerial reputation of men pleasing, ecclesiastical effeminacy. From the beginning of the church, the scriptures have been clear that “We ought to obey God rather than man” (Acts 5:29). Let the cowards of Christ rail on, as the men of God’s calling preach on! If you have the calling from God, and the courage and character to keep preaching regardless of the costs, the Street Preachers’ Fellowship has a place for you. When the conflict grows, it is our Creed as Street Ministers to be there with you. Come try us, and see what God will do.